One of the things I hear most often from students and customers is "I know the basic stitches, but have no idea how to read a crochet pattern". In fact, it wasn't so long ago that I was in the same boat, struggling to understand what all of the letters, numbers and abbreviations meant! Most searches on the internet throw up only a list of abbreviations for the terms used in crochet in either US or UK crochet. Of course this is crucial information, but it isn't the whole story. When you get to the basic instructions of a crochet pattern, there are a number of things you need to know in addition to the common abbreviations. In many ways, its like a code or another language that tells you how and where to make stitches. Unfortunately, each designer and publication will do things a little differently, which can add to the confusion. While I don't believe that there should be any sort of dogma in pattern writing, people do need to understand what you are telling them to do. And while testers and tech editors can really help with pattern clarity, the reader still needs some basic pattern information. At the beginning of the line, you should have some indication whether you are working in rounds or in rows. Immediately following this, you will have an indication of what row/round you are currently on. Numbers in brackets (parentheses) refer to the corresponding instructions for different sizes, working from left to right, smallest to largest. If there is a "-" in the instruction, this means that this particular instruction doesn't apply to that size. Next up, you should have some indication of what the beginning chain will be. You should also have an instruction, either in the pattern or in the beginning instructions of the pattern, of how this stitch will be counted in your stitch count. This is done because the first stitch at the beginning of a row or round in crochet needs to be raised up to the correct height of the rest of the following stitches, otherwise the work will be sloped. A designer needs to make a decision whether or not this is counted as a stitch and what works best with the pattern. In this example, the next section of instruction means to make 2 half double crochet stitches into the next stitch of the previous round (the pattern tells us the previous round was a double crochet) and then make 1 half double crochet in each of the next 2 stitches. 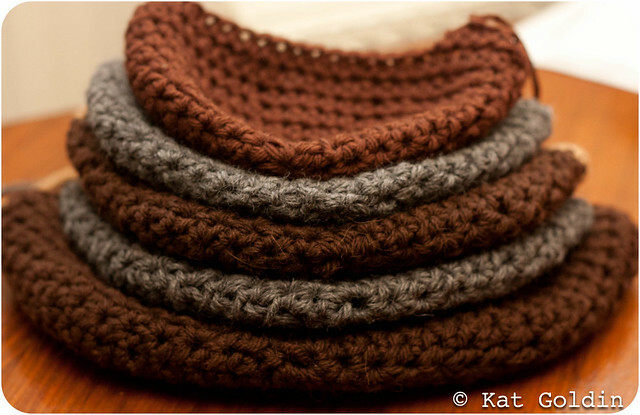 This is often when there variation occurs in crochet patterns. When I first started writing patterns, I would have written "HDC2, 2HDC" for the same line...not terribly clear. If you do come across problems in any designers patterns - ASK! Don't get in a muddle. Its not worth the frustration. In this case, that line of pattern is in square brackets (some designers may use normal parenthesis/brackets) . This tells us that bit of pattern is repeated the number of times directly after the second bracket. In this case, 4 times. There may be variation in relation to sizes, following the same left to right, smallest to largest order. When instructions are preceded by a *, this means to repeat that sequence of stitches as many times as indicated, usually to the end of the round or row. 'Join' means to join the round with a slip stitch. This is usually used at the end when working in rounds. 'Turn' means to turn your work. This may not be in the line if there is a general instruction at the beginning of the pattern for how to deal with turning. The stitch counts at the end of the row tell you how many stitches you should have worked in that row or round. This may be followed with the specific stitch that is used in the round/row, the word "stitches" or nothing. Does that help anyone? I certainly hope so!! Experienced crocheters, have I forgotten anything? For the Math-a-phobic, stay back. There are sime heavy calculations going on below. There is nothing wrong with making a hat by eyeballing it or going by a pattern. This is just the way I like to torture blog readers. So, I said yesterday that the method I described was the "easy way". You basically pick a stitch, crochet a flat circle until it measures close to your diameter and then work even until its the right height. Its all fine and dandy and pretty no-fool when you are working in simple stitches and in lighter weight wool. You can run into problems when you are working in more complex designs and bigger wools. Basically a completed round may not be anywhere near the diameter of a circle you are needing or you may have a stitch pattern that requires a certain number of stitches in a round. This is where maths can play a crucial role. The example below is using a US Half Double Crochet (UK Half Treble) for ease. With such a straight forward stitch, you probably will be fine with using a 6 or 8 stitch increase for the flat circle to get to the desired number of stitches to reach your hat circumference. You can just use step 1 to formulate that. However, I go into the further detail for when we look at lace and more complicated stitches in future posts, where increases need to be more precise. As an example, I am going to do the equations for a 1-3 year hat, with a 17inch hat circumference and a 5.5inch diameter. Armed with this information, I need to figure out how many stitches will make up my circumference and over how many rounds I need to build up those stitches for a nice even crown. First, lets figure out how many stitches are required for the HAT circumference. To do this, you need to multiply the hat circumference by the number of stitches in your gauge. The number you get is the # of stitches around your final circumference will be. Then, you need to multiply the diameter of the required hat size by the number of rows in your gauge swatch. Then, because when measuring across a flat circle, each round equals two rows, you need to divide this figure by 2. This is the number of rounds that will make up your diameter. Now, obviously you can't have 0.5 of a stitch or 0.97 of a row. You'll need to make a judgement on each. Generally speaking, I estimate the rounds to the nearest complete number. In my example, its obviously 8. Next, you need to figure out how many stitches to increase in each round, or what number stitches you'll crochet into your first loop and then increase by over the rounds. This is calculated by dividing the stitches in the circumference by the rounds in the diameter. In my example: 59.5/ 8 = 7.43 stitches per round. - To get the correct sizing, round down to the nearest number (in my case 7). Then in an additional round (in my case, round 9) increase evenly by the remaining 'hanging stitches' (in my case 3). Then you need to work even until the hat height measures your desired size. There are so many variations to this process, which I can not go into in this kind of format. However, once you get this basic principle, the possibilities are endless, including sizing up and down for writing a pattern. - Slouchy hats tend to have longer heights and a diameter that will fit snugly on the wearers head so it doesn't slip down over their eyes. - Beret styles are larger circles so the diameter of the circle makes up much of the hat height. Obviously the bottom few rounds need to be decreased to a good snug fit. Notes: Though I write about inches, it will work just find if you measure in centimeters. There is soooo much more I could say about hat design and pattern writing, but I am going to leave it here for now, as this gives a very basic foundation. I am toying with the idea of putting all of this (and the other important information) in a pdf, but time is limited at the moment. However, if you have any questions, please ask either in the comments section or on facebook and I will do my best to answer. How to Design a Hat, Part 1 is here. The full interactive eBook is available here. Subscribing in a reader or liking Slugs on the Refrigerator on Facebook are great ways to be alterted to when I post part 3.